We specialise in Land Rovers and do vehicle registration inspections, wheel alignments, engine and transmission rebuilds. We also perform ECU upgrades. Service all makes and models of two and four wheel drive vehicles with diagnostic equipment. Full workshop facilities and a comprehensive parts department. We are a small team in a busy workshop in Annangrove NSW. 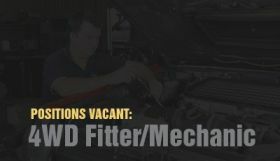 An opportunity now exists for a qualified and experienced Land Rover Service Mechanic / Technician to join our workshop. Perform automotive mechanic duties to repair and maintain vehicles in good condition. Do a full diagnostic health check and report on vehicle. Repair and check the performance of automotive vehicles. Repair exhaust, brakes, hydraulic, electrical suspension and fuel ignition of automotive vehicles. Check and repair electrical suspensions and wheel alignments of automotive vehicles. Perform oil changes, tyre rotations, and belt changes of automotive vehicles. Check and repair air conditioning, computer and electronic systems. Maintain and manage tools, equipment and machinery in good condition. Ensure total customer satisfaction through excellent automotive mechanic services. Conduct quality checks on all work done and road testing vehicles. Have a current Motor Mechanic Trade Certificate. Trade qualification and previous experience and a Master Technician in Land Rover and able to work on older models as well as new Land Rovers. A current clean driver's licence and be able to drive a manual vehicle. Be reliable and have a good work ethic. Follow Work Health and Safety procedures and company policies. Have good eye for detail. Be able to perform RTA inspections preferred but not essential. Air conditioners licence preferred but not essential.